A joke on Family Guy tonight sent me to Wikipedia trying to figure out which pizza company had employed the Noid in its advertising campaign. Domino's, it turns out. You remember the Noid, of course. He was the jabbering imp in a skintight, rabbit-eared suit who would, for no apparent reason, sabotage people's attempts to enjoy their pizza. Given that the pizza came from Domino's, you have to wonder if these actions really qualify the Noid as malevolent. Anyway, in addition to clarifying the context of the Family Guy joke — something that Wikipedia is extremely useful for — the article on the Noid includes a paragraph on a guy named Kenneth Lamar Noid. This guy, who already suffered from a mental illness, held two employees of an Atlanta Domino's hostage in 1989 because he felt the Noid character mocked him. Mr. Noid's demands were as follows: a $100,000, a getaway car, a copy of Robert Anton Wilson's The Widow's Son, and a pizza. He got the pizza. After eventually surrendering to authorities, an Atlanta officer famously described the man as "paranoid." Ha. It's the little footnotes like that that make pop culture minutiae worth reading about. 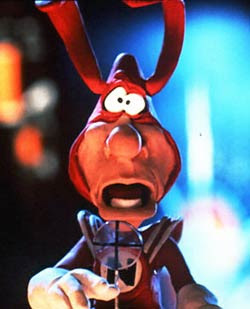 That there was ever a point in history at which the Noid was newsworthy? Amazing. A bonus: Family Guy's Noid attack.